Books by Andreas, including: Startup | How to Write a Book! | #TwitterBook | The ASO Book | The Big Book of Content Marketing | SEO eBook | Search Engine Marketing | Insider SEO & PPC | Hands-On Web Design. Plus contributions to other books, books that include me, and so on. I'm the author of +14 books on digital marketing and SEO. Three are Amazon #1 Best Sellers. I've also contributed to other books and a few books have written about me. Many are available at Amazon.com or Barnes & Noble (BN.com). Want free advance copies of my books? Subscribe to my Monthly Newsletter. How to build your Silicon Valley startup, find co-founders, select accelerators, deal with investors, and sell your startup. Based on interviews with 26 founders, heads of accelerators, and VCs. Get the #1 Amazon Best Seller in English, French, and Korean. Spanish in March 2019; Chinese in April 2019. Available worldwide. When I told my friends I was writing a book on how to write books, they said, "OMG! I need that book!" Why write a book? You'll get opportunities. Speaking engagements, projects, jobs, invitations to join advisory boards with pre-IPO stock, and invitations to start companies (and yes, dates). Get the #1 Amazon Best Seller! See How to Write a Book! #TwitterBook by Andreas Ramos (published by andreas.com. 1st ed., Oct. 2013. 2nd ed. Sept. 2014. 86 pages, illustrated, index. Revised and updated. ISBN 978-0-9893600-4-3). Do you "get" Twitter? The inside scoop on Twitter. In only 86 pages, learn how to use hashtags, get followers, and use Twitter in plain English. Lots of details: What teens are doing on Twitter, how the police uses Twitter, and how to use Twitter in a disaster. The Big Book of Content Marketing by Andreas Ramos (published by andreas.com, May 2013. 160 pages. ISBN 978-0-9893600-0-5, illustrated, index). 80% of your digital advertising doesn't reach your audience. People delete cookies or use ad blocking software. There's a new solution. Use content marketing and people will come to you. This book also shows you how to align your marketing with your company's business goals to meet top-line/bottom-line KPIs. More at The Big Book of Content Marketing. Search Engine Marketing by Andreas Ramos and Stephanie Cota. How to use analytics to manage multichannel marketing (SEO, PPC, social networks, email, and other channels). (McGraw-Hill, 2009. 267 pg. ISBN 978-0-07-159733-3. Illustrations, tables, index). Available at Amazon , Barnes & Noble, and other bookstores in North America, Europe, and Asia. See the webpage for the book. Buy the book at Amazon.com . Search Engine Marketing: China Edition by Andreas Ramos and Maggie Guan. How to use analytics to manage multichannel marketing. Translated to Simplified Chinese. (Tsing Hua University Press, Beijing, China, 2010. 290 pg. ISBN 978-0-07-159733-3. Illustrations, tables, index). Buy the book at Amazon China. Search Engine Marketing: Taiwan Edition by Andreas Ramos and Stephanie Cota. How to use analytics to manage multichannel marketing. Translated to Traditional Chinese. (McGraw-Hill Taiwan, 2010. Illustrations, tables, index). Available in Taiwan. Buy the book at Books.com/Taiwan. Insider SEO & PPC, by Andreas Ramos and Stephanie Cota. How to use search engines to get qualified leads, prospects, and customers by building and managing SEO and PPC campaigns. Interviews with Google, Microsoft, Clicktracks Web Analytics, and others. 26 case studies. 47 tips & tricks. (Second edition. Jain Publishing, 2006. 256 pg., 35 illustrations, tables, index. ISBN 2006 978-0875730882). Available at Amazon, Barnes & Noble, and so on. Insider's Guide to SEO, by Andreas Ramos and Stephanie Cota. This was the first version. After a year, we updated it as a second edition (see the book above). Hands-On Web Design, by Andreas Ramos. This came out in February 1996 and was one of the first books about HTML and web development. By 1998, there were hundreds of books on HTML, but I was one of the first. The book sold very well. PCs for You and Me: Guide to DOS and Windows, by Andreas Ramos. This was a great book, but too late for the market. Windows came out in August 1995. So did Netscape. Within months, nobody cared about Windows anymore. The hot topic became HTML and web design. Your Second Manual, by Andreas Ramos. I wrote this in Denmark in 1989. The Atari ST was the top computer in Europe from 1986 to 1992. My book was noted as "Most Significant Product" by a leading UK computer magazine and I was "Man of the Year" by a computer magazine in Spain. This was before email and I got dozens of letters from readers every week. I even appeared in a Danish cartoon strip for several years. The book sold over 25,000 copies at $45 each. Published in Danish, Swedish, English, Spanish, French, German, and Finnish. Free copies of various ebooks. I've written several more. Want one when I release it? Subscribe to my Monthly Newsletter. 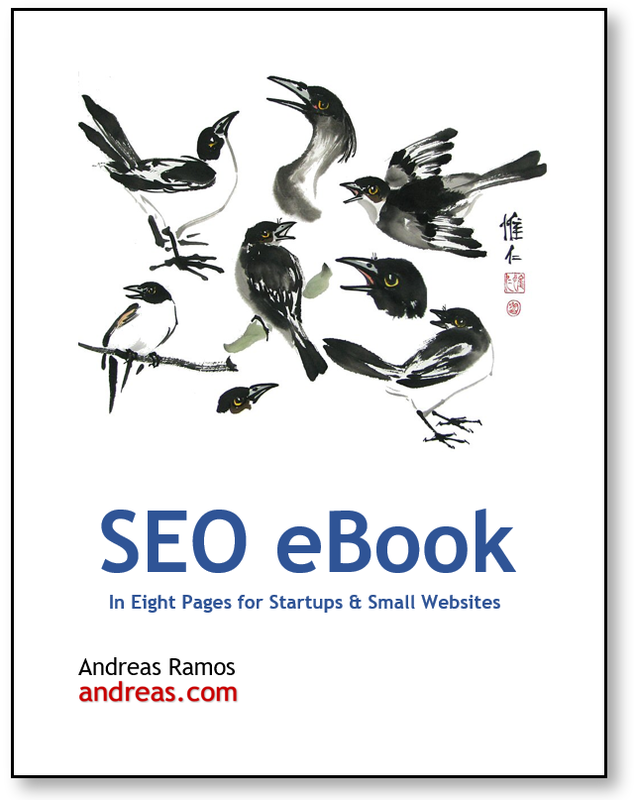 SEO eBook by Andreas Ramos. Be findable in search engines. This free ebook covers technical SEO, strategic SEO, SEO for social media, and SEO for content marketing. A 36-page ebook on the basics of SEO. I wrote a short guide in only eight pages for my students to do SEO for their own websites, their family's small business sites, and so on. Step-by-step, all links, and so on. The ASO eBook: App Store Optimization by Andreas Ramos. Get my ebook on ASO. You use SEO to get to the top of search engines. You use ASO to get your app to the top of the app stores. Covers strategy and tactics. Practical, hands-on, and in plain English. The ASO Book: App Store Optimization by Andreas Ramos. Oct. 2014. Illustrations. 34 pages in print. Amazon eBook for $3.95. ASIN: B00OAM4DC0. To get the ASO ebook for Kindle, ASO ebook. Analytics eBook. Short ebook on Google Analytics. What you really need to know. 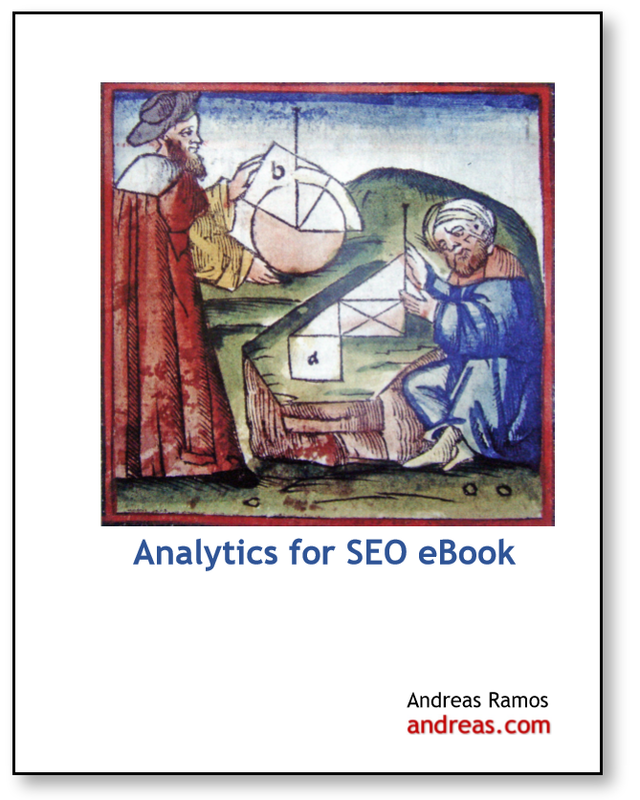 Go Google Analytics eBook. PPC eBook. Free eBook on SEM (search engine marketing) with Google Ads and PPC (pay-per-click). Go PPC-eBook. KPI eBook: Use basic math to calculate KPIs, Cost-per-Lead (CPL), and Cost-per-Action (CPA). Free eBook. Over 30,000 copies have been downloaded. Go KPI eBook. I've written content that was published in other books. The best known is my article about the Fall of the Berlin Wall. I was in Berlin that night when the Wall fell. Millions of people were in Berlin but I was the only one who wrote about it. It's been published in many history books and school books. I'm the technical editor of Search Engine Marketing, Inc. by Mike Moran and Bill Hunt (IBM Press, 3rd ed., 2014). This is the authoritative book on enterprise-level SEO. Mike is a Distinguished Engineer at IBM and was head of IBM SEO for 15 years. The Berlin Wall. Edited by Cindy Mur. The book presents three original source materials and three academic articles about the Berlin Wall. The three source documents are a speech about the Berlin Wall and freedom by John F. Kennedy (president of the United States), a secret speech to the Soviet Communist Party by Nikita Kruschev (premier of the Soviet Union), and my account of the Fall of Berlin Wall. Grammar for Writing: Complete Course. By Phyllis Goldenberg, Elaine Epstein, Carol Domblewski, Martin Lee, Beverly Ann Chin. This is a standard American high school text book. They also republished my Berlin article. Secret Peace, by Jesse Richards. History's trend: declining war, advancing health, equal rights, revolutionary technology, and more, including the surprising reasons why peace is unfolding. A powerful call to action to step up our efforts to spread peace Esther Dyson, author of Release 2.0, says, "I love the thesis and believe it. Jesse Richards makes the case." He also cited my Berlin article. The Cold War: Chronicles of America's Wars, by Josepha Sherman. Another republication of my Berlin article. Complete Idiot's Guide to Technical Writing, by Krista Van Lann and Catherine Julian. Yeah, I'm in an Idiot's Guide. Is this a good thing or a bad thing? 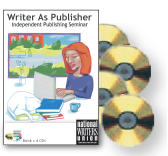 Writer as Publisher: Independent Publishing, edited and produced by Andreas Ramos and Stephanie Cota. Stephanie and I arranged a day-long seminar for independent publishing by writers. We recorded the seminar and produced the book and four-CD set. We also set up an ecommerce site for this project. The books and CDs were published by the NWU. Breaking Into Technical Writing, edited by Andreas Ramos. I organized and led annual seminars on technical writing. I also produced the books for these. These were published by the NWU. There are several books which include chapters or sections about me and my work. Work in the New Economy: Flexible Labor Markets in Silicon Valley. By Chris Benner. A book on the economics and strategies of contractors in Silicon Valley. I was interviewed for this and made comments on the draft manuscript. Gurus, Hired Guns, and Warm Bodies: Itinerant Experts in a Knowledge Economy. By Professors Stephen R. Barley and Gideon Kunda. Steve Barley is the Charles M. Pigott Professor of Management Science and Engineering and Co-Director of the Center for Work, Technology, and Organization at Stanford University's School of Engineering. Professor Gideon Kunda is at the Department of Labor Studies at Tel Aviv University. Careers Creating Search Engines, by Judith Levin. I'm mentioned in this book. Internet Culture. By David Porter. I'm also mentioned here. National Writers' Union Freelance Writers' Guide. By James Waller for the NWU. Mentioned again. Viral Change: The Alternative to Slow, Painful and Unsuccessful Management of Change in Organizations, by Leandro Herrero. I'm also mentioned in this book. Language Machines: Essays from the English Institute, by Jeffrey Masten. And another mention. Rubble: Unearthing the History of Demolition, by Jeff Byles. From the straight boulevards that smashed their way through rambling old Paris to create the city we know today to the televised implosion of Las Vegas casinos to make room for America's ever grander desert of dreams, demolition has long played an ambiguous role in our lives. In lively, colorful prose, Rubble rides the wrecking ball through key episodes in the world of demolition. My Berlin article was included in this book. Trudy's Promise, by Marcia Preston. Branded the wife of a defector and sent to prison, Trudy Hulst, wondering if her husband survived his attempted escape past the newly constructed Berlin Wall, makes a break for freedom, determined to find the son she had to leave behind. 40,000 first printing. My Berlin article was also cited in this book. I've written many white papers. These are generally PDFs for download. A number of these are at my website. SUN Microsystem's Guide to Internationalization: How to adapt SUN Microsystems UNIX software into 32 languages. SGI (Silicon Graphics): Produced the documentation set in German, French, Spanish, and Japanese. Netcom's UNIX manual (1994): Netcom.com was the first public ISP and for two or three years, nearly everyone in Silicon Valley used it. I wrote the manual for it. Brio Technology documentation for business intelligence (BI) tools for UNIX and Windows in English, German, French, Italian, and Japanese. I've also written articles for British, Danish, Swedish, Norwegian, Italian, Spanish, German, Chinese, and US computer magazines.